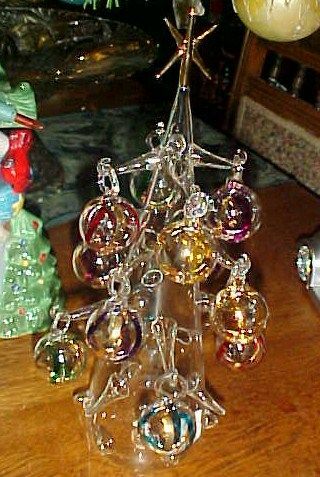 This is a hand blown glass Christmas tree is identical to the ones made by Soffieria Parise in Italy selling for almost 200.00. It features a beautiful clear glass tree with a gold star topper. There are 11 hand blown glass ornaments to hang on the branches. They are clear with gold and red, and green swirls. It is made in China but stunning and was purchased at Gottchocks It measures about 12" tall. The tree is in lovely condition with no breaks that I can find. The ornaments all have their blown glass hanging loops. Everything is pkg in the original box with foam packaging. It looks to have never been used.